Teams in HubSpot allow you to organize your users into groups for organizational and reporting purposes. If you are an Enterprise user, you can also create a team hierarchy by setting up parent-child relationships between your teams. In the left sidebar menu, navigate to Users & Teams. Click the Teams tab, then click Create team. In the right panel, enter a team name. If you are an Enterprise user, you can create a team hierarchy and make your new team a child of an existing team. To do so, select an existing team from the Parent team dropdown menu. Check the box(es) next to the team member(s) you'd like to add to this new team. 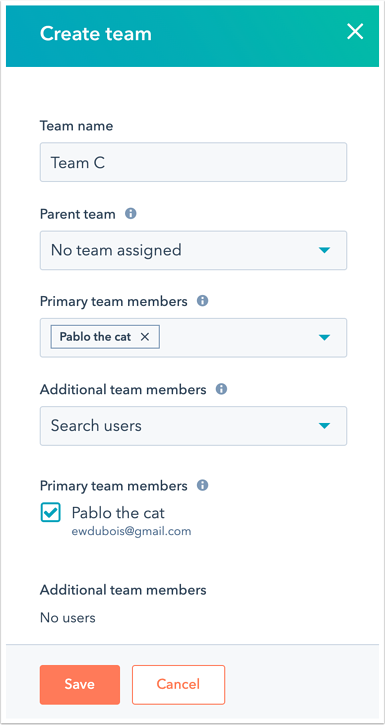 You can also use the Add team members field to search for team members. Browse or search for your team. If you are an Enterprise user and the team you want to edit is a child team, click the parent team name first to locate your team for edits. Hover over the team name and click Edit to make changes, or click Delete to remove the team from your account. Make changes to the Team name field as needed. If you are an Enterprise user, use the Parent team dropdown menu to add, change, or remove the parent team. Check or uncheck the box next to any user(s) you want to add to or remove from the team. Please note: users with Team ownership permissions can access records owned by any members of their assigned team(s) and, if you have parent-child teams (Enterprise accounts only), the members of their team's child teams. Learn more about team only permissions.